I’m not discounting the thought that scientists will someday figure out a way to develop nitrogen-fixing grass varieties, but until that happens, nitrogen will remain our most needed input for profitable grass production. Though forage plants can survive and thrive on excess soil reserves of phosphorus and potassium, nitrogen is an entirely different matter. Sure, some nitrogen is mineralized and made available to plants each year from soil organic matter, but rarely is there enough to sustain full-production potential. 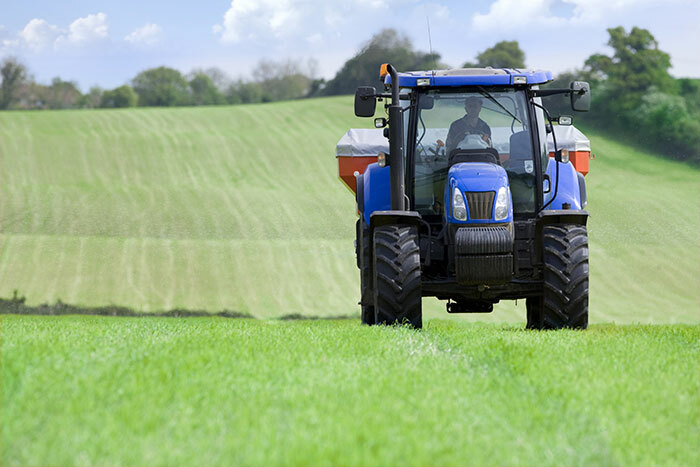 For this reason, if you grow grass, nitrogen fertilizer is often the input that yields the greatest bang for your buck and the last one you should look at to cut corners. Perennial or annual, warm- or cool-season, bunch or rhizomatous, all grasses need nitrogen. Currently, retail nitrogen prices are neither at historic lows nor highs. In the most recent Illinois Production Cost Report from USDA, dry urea was averaging $363 per ton, or about 40 cents per pound of actual nitrogen. When formulating a nitrogen application strategy for grass hayfields or pastures, don’t let some of those input dollars blow away in the wind, warns Dennis Hancock, extension forage agronomist with the University of Georgia. “Significant amounts of nitrogen can be volatilized and lost to the atmosphere if dry urea is spread on top of the soil surface and rain doesn’t occur shortly afterward,” Hancock says. Research studies in Hancock’s state have documented losses near 50 percent, though more typical loss figures are often in the 20 to 25 percent range. Hancock and other forage agronomists usually suggest using a urease inhibitor when applying dry urea. These products are generally economical and inhibit the urease enzyme in the soil from hydrolyzing the urea and releasing ammonia to the atmosphere. In Georgia research, using a urease inhibitor (Agrotain) resulted in a 10 percent yield bump on bermudagrass-treated hayfields compared to using untreated urea. In a recent Miner Institute (Chazy, N.Y.) Farm Report newsletter, Ev Thomas offered several tips for producers who have pure grass hayfields. Thomas, who is a retired agronomist from the Miner Institute and now operates his own consulting business, suggests applying nitrogen to cool-season grass stands soon after the grass breaks dormancy this spring. Thomas reminds producers that the nitrogen in manure is as good as fertilizer nitrogen, but applications made during this time of year often risk cutting up soft fields. He suggests delaying manure applications until after first cut or when fields have firmed up. The New York agronomist also cautions producers not to apply too much nitrogen fertilizer following the first cutting because it can reduce plant tillering. “That’s especially true for perennial ryegrass, tall fescue, and probably meadow fescue,” Thomas says. “Apply 50 to 60 pounds per acre of nitrogen on your best grass stands and 30 to 40 pounds per acre on the rest,” he recommends. Thomas suggests a similar amount of nitrogen be applied during August to boost plant carbohydrate levels, which should result in higher yields the following spring. Another New York agronomist, Tom Kilcer, has done extensive work with various nitrogen strategies for winter annuals, especially triticale. The Kinderhook-based crop consultant says in his most recent Crop Soil News newsletter that fall-applied nitrogen on winter triticale does the most good when plantings are made on or preferably two weeks before the optimum winter wheat planting date. The early planting date coupled with some nitrogen can boost tiller production and ultimately spring yields. “Once you get past the wheat planting date, fall nitrogen starts to be a waste of money for winter forage production,” Kilcer says. In the spring, Kilcer is currently recommending about 100 pounds of nitrogen per acre be applied to triticale with a urease inhibitor. For winter rye, he suggests no more than 75 pounds of nitrogen per acre to prevent lodging. The New York research is suggesting that the spring-applied nitrogen on triticale significantly boosts the forage crude protein content, even if fall nitrogen or manure applications were made. In summary, if you plant grasses of any type, nitrogen is your key to profitable production, and it’s probably best to look elsewhere for opportunities to cut input costs. Now is the time to consult your state university’s recommendations for economic nitrogen application rates in your area.